So Solas was just pretending to be a friend of the Inquisition in order to get the orb back and then use it in conjunction with the anchor? What exactly is the relationship between the orb and anchor. I guess he was helping to seal the breach as a show of loyalty knowing that once he had the orb it wouldn’t matter anymore? Who are the ‘Agents of Fen’harel’? To be honest learning about them messed me up a bit, in the same way as the Mass Effect indoctrination theory did. 😛 I like to get pretty deep into these games and hearing about such things feels like a real betrayal. So.. could Sera have been one? She spreads chaos..I think Solas needs this, as a weakened Thedas full of in-fighting would help in his plan. Why else would he have sacrificed the Divine Justinia and allowed the Qunari plot to progress? In the end I vowed to bring him back to his senses, he said he hoped I would prove him wrong again what does he mean by that? Did Flemeth pass on her power to Solas instead of Morrigan? What exactly is the relationship between Mythal and the Dread Wolf? BTW I always found those wolf statues super creepy.. And is her dragon form related to the old gods? Who exactly resides in the Golden City? It could be any number of different people depending on whose story you follow. And could the Darkspawn be related to the Forgotten Ones? I am personally hoping that we see a return of Andraste’s bloodline in DA4 as I think it could be very interesting seeing as it may be set in Tevinter.. I need to replay parts of the game.. its all so epic and weird and dealing with history is such an intriguing way. 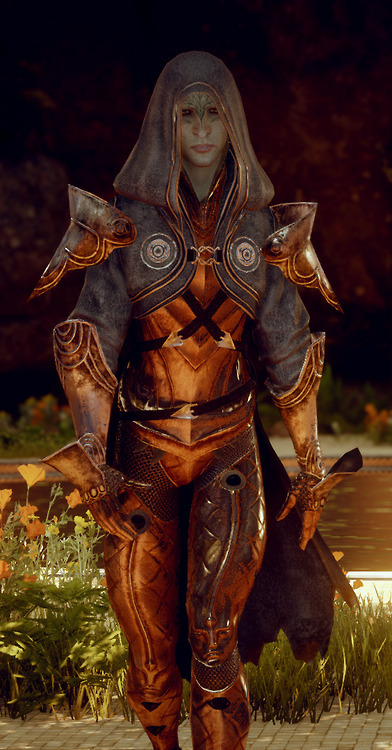 Personally I think Solas should just forget it.. he made a mistake, whats done is done, empires rise and fall, knowledge is lost and new knowledge gained. He hated the world before the veil, why would he want to bring that back?????? I just had the most amazing 4hr DA:I session ever, my head is full of fluffy clouds right now.. So much happened, so much I am curious about, so much to learn…. It all started at the war table when my advisors committed their troops to the ‘final’ push. The cut scene had me shouting ‘yes yes yes’ whilst bouncing on the sofa 🙂 and I wish we had a ‘Dragon age’ banner afterwards to help cement the momentous occasion, but I guess we know which game we are playing.. Here is the cut scene.. could contain spoilers… in fact don’t watch this if you are going to play the game.. please.. I fought side by side with some of my advisors and then arrived at the Temple of Mythal!!! omg omg omg! I read several of the mosaic notes, which were fascinating, I will be going back to see if I missed any. I thought I had killed Samson earlier in the game but used Dagna’s rune on him in the temple. Dagna has also weirded out after researching the rifts, I hope she will be ok and think she may hold the key to solving Corypheus’ power. Also what we learnt about his companion is really really interesting, I’m looking forward to learning more about that!! Back at skyhold I’ve spoken to Cassandra who seems keen on being the next Divine, I think it would be a great choice for her as I feel she wishes to brush off her thug image and really looks up to Vivienne. Selfishly I want her to continue fighting by my side.. for ever! Leliana is also enthusiastic about being the Divine but I think she is too ruthless.. I left Cole in a catatonic state on a wall having an identity crisis, Dorian seems incredibly empowered. All in all it was a brilliant quest which I think may have even surpassed my love of Mass Effect.. I was absorbed into every moment of it, every fibre of my being was strained as we fought our way to the Temple and encountered it’s occupants, my fear at doing that thing Morrigan wanted to do, my utter regret at not completing the rituals and having to do that other thing (please please please let some of them survive) Solas shouted at me then too and I even shouted back at the tv! LOL saying ‘well if the ritual was meant to be easy it wouldn’t have been much of a barrier would it! !’ and learning about how far Corypheus’ power extends is frightening. I’m on my final push to defeat Corypheus, I need to clear all my outstanding war table missions first though, we have belts of focus, lots of bees (they seem to be the best thing against red templars etc), Some of us have seriously pimped well crafted formal attire armour which weirdly enough has a huge armour rating. I managed to pick up something which makes be invisible periodically, and a weird resuscitation ability with shields that spin around me. I have doped Cassandra up with loads of Mighty Offense Tonic.. she is unbeatable on that stuff. Vivienne is mastering her Knight Enchanter skills, Varric… well I just look out for him as much as possible and feed him healing potions. They are the best team ever..
Other team members such as Cole, Sera, Dorian, Iron Bull etc are great for chatter though. I’m only level 19 and still have loads of secondary quests to do so it may be a while before I commit to what they are saying is the final push.. I have a feeling that it may not be..
I’m trying to string out the game for as long as possible as I cant see anything as good coming out until Mass Effect Andromeda..
My evening sign out routine involves getting a kiss from Cullen then heading over to my apartment, changing clothes and looking out over the balcony at the mountains. It’s so nice to start again the next day all fresh etc rather than being stuck in a bog, dungeon or wherever you were questing the night before. I got out of the Fade, it seemed too easy? I do have a superb team with me though (Vivienne, Cassandra, Varric) who seem indestructible, I’ve been tooling them up with accessories and potions which has helped. I’ll put the difficulty up to ‘hard’ and see how they fair. I found that the notes in the Fade were some of the most emotionally engaging so far and gave me a new perspective on the history and politics of the DA world. I feel as if I’m near the end of the game and there is still so much I want to do, I’ve cleared Crestwood, most of the Hinterlands and have almost finished the Exhalted Plains.. although I’ve been trying to find a way through the mountains for ages to get Vivienne what I think may be her face cream ingredients!! The Western Approach seems to be as huge as a whole other game so I’m looking forward to exploring there. I think I have a weird bug where I fill my requisitions and am then given the same one over and over again, getting more and more powers as I fill them immediately, but maybe they are all slightly different..
I’ve only met 1 dragon so far, I prepped the team with belts of electricity resistance, plus I brought along Dorian who has Spirit mage skills useful for the dragon’s vulnerabilities. I’ve heard about dragon hunting so I’m looking forward to this. Blackwall has finally told me what’s been bugging him since he was a boy..was that all? Luckily I dumped him ages ago as I couldn’t take it anymore.. However Cullen is more like a puppy than a man.. Hopefully he will improve.. I spent quite a chilled time in the forests of the Emerald Graves last night, it is so beautiful and peaceful there, also spent a bit of time riding around the Hinterlands on my beautiful horse/stag.